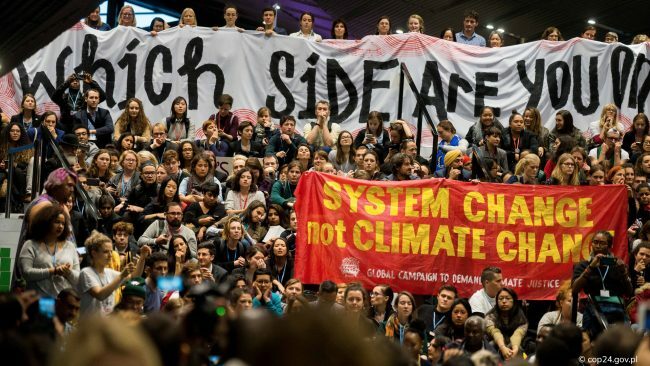 Home » COP24 – we have agreed the rules, now let’s make a plan that works! The UN climate change talks (COP24) in Poland drew to a close yesterday with the announcement of an agreed set of rules for the Paris climate process. Paul Allen shares his thoughts on the talks, and looks at what must happen now. The UN COP negotiation process can sometimes seem very distant and utterly filled with impenetrable language, but ultimately it is rooted in trying to manifest a secure future for all. However, the overbearing presence of the fossil fuel industry combined with a rather coal-focused Polish Pavilion and Presidency which lacked the commitment shown by last year by Fiji COP president, cast a shadow over this year’s COP24. I know from personal experience that the COP process can be highly exhausting, so I must offer my thanks to those who kept the process rolling late into the night and into the following day. Even though there is still much that needs to change, it is vital the Paris process keeps rolling. Thankfully, COP24 in Katowice adopted ‘the Paris Rulebook’. These are the complex diplomatic guidelines for the implementation of the Paris Agreement to deliver zero carbon at a global level. As you can imagine, this is actually a very technical issue, as different nation states have different definitions of carbon emissions and very different timelines for their various actions. 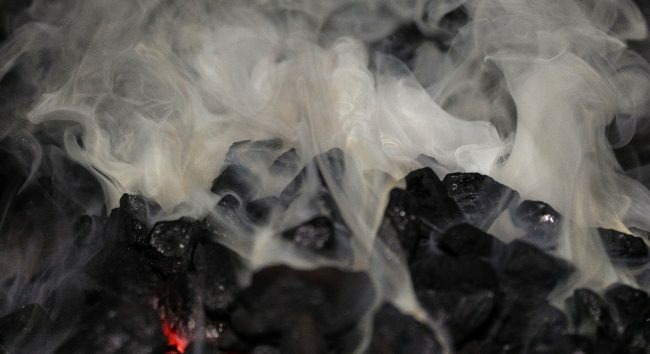 However, after much ‘extra time’, and last minute rows over carbon markets, 196 states finally signed up to a common rulebook, clarifying regulations that will drive how countries cut carbon, provide finance to poorer nations and ensure that everyone is doing what they say they are doing. Most importantly, the world must recognise that COP24 is only an agreement on the rules of the game, not on a strategy for winning. Scientists and policymakers have made it clear that the outcome from COP24 does not yet offer a plan that will prevent catastrophic climate change. The Intergovernmental Panel on Climate Change’s 1.5˚C report sent a strong message from the scientific community – that staying within 1.5˚C of warming above pre-industrial levels is a much safer place for humanity, and that it is possible to keep warming to 1.5˚C. Many governments, especially those who are already facing severe climate impacts, were keen to take this message on board and rise to the planetary emergency. But, as is often the case with international agreements, a handful of countries such as the US, Australia, Brazil, Indonesia, Russia and the UAE stopped that from happening – despite the fact that many of them are also experiencing the reality of climate impacts. Many delegates made passionate calls for a rapid increase in ambition before 2020 to keep the chances of staying under 1.5˚C alive, highlighting the urgent need to agree financial support for poorer countries to take action on both mitigation and adaptation. 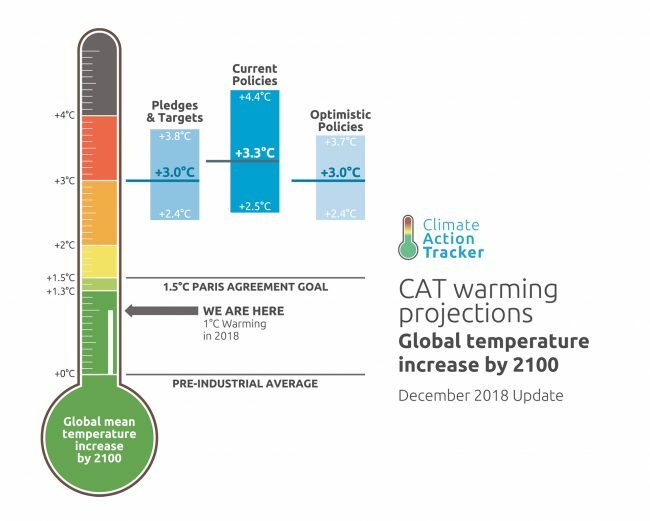 Analysis from Climate Action Tracker shows that if all governments press on and achieve their largely insufficient climate targets, the world will see 3.0˚C of warming by 2100, twice the 1.5˚C limit of October’s IPCC report. Another good way to understand the difference between where the current COP pledges take us and where we need to be is the UN Emissions Gap Report. This year’s report incorporates the latest scientific information, including the IPCC Special Report on 1.5°C. The key thing that gives me hope is that the trend is our friend. Clean energy prices are falling faster than anyone predicted, divestment is moving into the mainstream and there is a growing movement getting ready to rise to the ambition gap. From the cities, such as London and Bristol, that have declared climate emergencies to the growing wave of citizen protests – people are setting the scene for government-level action plans that would unite us across borders, cultures and religions. So the future is unwritten, but at least we are still on the road. We just need to accelerate progress, if we are to make our destination on time. Country delegations must now return to their homelands and begin the serious work of enhancing ambition by 2020. Having an agreed rulebook can build trust between countries, remove any excuses for not signing up to action, and allow us to measure our collective progress – which, after all, is better than being off the road in a ditch. For more information, the Climate Action Network offers perspectives on COP24 from a range of independent analysts.